Editor’s note: Tonight I give you an article on dividend growth investing. Dividend growth investing is the kind of investing I’m yet to learn more about and experiment with. This is why, this post is written by Lewys Thomas who by day is studying for his university degree and by night blogs about dividend investing on his blog FrugalStudent.co.uk. Hope you find this blog post helpful. Interest rates are rock bottom – The Bank of England cut them another 0.25% because of the uncertainty around Brexit. Banks are slashing the interest rates they are paying customers with the popular Club Lloyds account and Santander 123 account reducing the interest they pay. Give peer-to-peer lending a try. With peer to peer lending you could get anything between 2.8 – 7% a year in interest on your money. My problem with peer-to-peer lending was that I was investing in smaller, very risky companies. 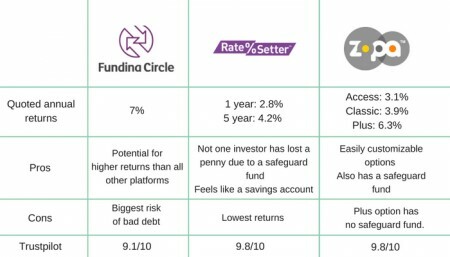 Sure, RateSetter and Zopa offer fixed rates backed up by solid ‘safeguard funds’ that protect you from bad debts but locking up for 4.2% for 5 years or earning just 2.8%-3.9% for 1years didn’t really appeal to me. I’m not knocking Peer to Peer lending – it is a good way for people to make a modest return on their money. If you’re interested you can explore the main options below. Just remember that peer-to-peer lending isn’t covered by the FSCS and there’s no ISA option at the time of writing. Right, since peer-to-peer lending didn’t appeal to me, so what did I do with my cash? There’s another option that is less well known and needs a higher level of knowledge and understanding; it can also bring decent return. Now, many people share a certain perception of the stock market. They imagine a floor full of screaming traders and the possibility of huge gains and even larger losses. This is the world of complex charts and big earners, right? Guess what? This is not how it works, really. There are no longer over-excited traders, not that we can see anyway. In fact, today investing in the stock market is relatively silent and solitary activity: it is between you and the internet platform you use to buy and sell shares. Buying shares, and making profit from it, is always about buying a small part of a very high quality company. There are two main ways to make profit known as value investing and dividend growth investing. In the former case you make money only from the increase in the value of the company, in the latter you make money also through the share of the profit that this company awards its shareholders, or dividend. These payments, or dividends, are the seeds of dividend growth investing. Simply put a dividend is a company’s way of rewarding you for owning their shares. For example, I own shares in McDonald’s. For every share, I own they pay me close to £4 (depending on currency exchange) dividend. So owning 10 shares would pay a yearly dividend of around £40. How do you know what to expect? You can check the percent of ‘interest’ a company pays by taking a look at its Dividend Yield. For example, investing £100 (less fees) into a stock that has a 3% dividend yield, means you’ll receive £3 a year in dividends. Let’s take a look at a real life example! Highlighted in red here is Lloyds Banking Group’s dividend yield. 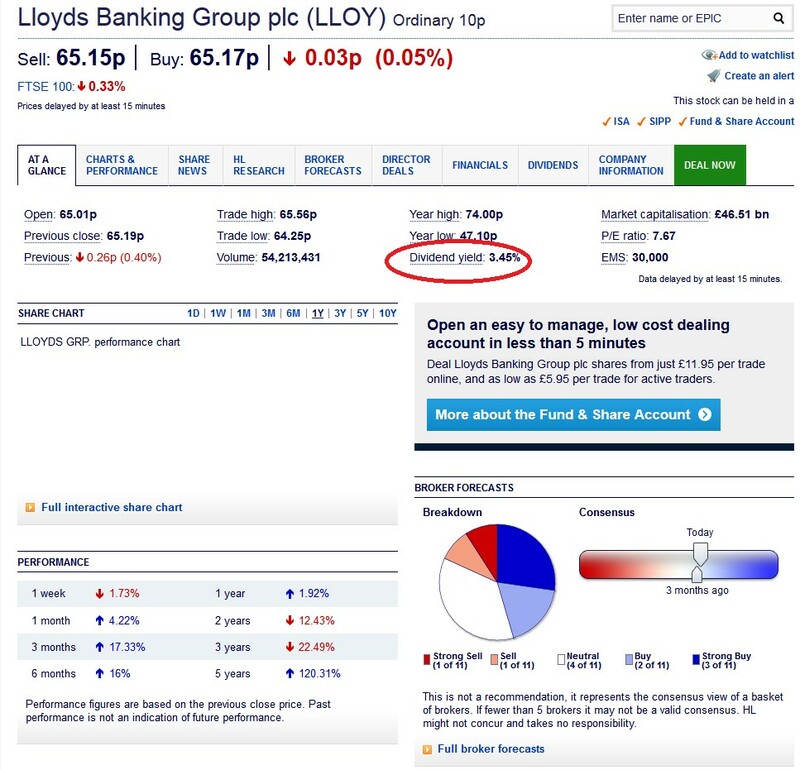 A 3.45% yield means that £100 invested in Lloyds would pay you £3.45 yearly. Ok, so now that we understand what dividends are we need to go a step further to understand what dividend growth investing is. Quite simply, dividend growth investing is investing in dividend paying stocks for a return. I’m a Dividend Growth Investor which means that I buy dividend paying stock in companies that have very long history of increasing their dividend payments. This tells me that pay-out is relatively reliable. Not only that, but as these companies consistently raise their dividend I can expect that my pay-out will rise too! Look, for example, at Johnson and Johnson’s dividend history. We can see clearly that Johnson and Johnson has increased its dividend payment, for the last 22 years; were we to take this further back in history, we’ll see that Johnson and Johnson has in fact grown its dividend for the past 54 years! Imagine the power of those increases and what will happen if you reinvest the dividend over just 30 years. Now, I know that Maria has written an excellent article on ‘the myth’ of compound interest but I do want to show the other side of the coin on this issue. Maria is right – compound interest is somewhat overrated. People usually get the maths wrong and overestimate their future returns. Nevertheless, compound interest remains a powerful tool if time is on your side and you combine compound interest with yearly increases in this ‘interest’ through dividend increases. Here’s how compound interest works with dividend growth stocks. It is also worth remembering that you can get up to £5,000 worth of dividends TAX FREE and that you can invest in dividend stocks through an ISA which means you are not going to pay tax on your dividends and on capital gains. My investing style goes beyond dividend growth investing but I’m trying to keep things simple here. The important point is that my net-worth has gone from zero to over £13,000 invested in the market. I also have a steady, although still small, stream of dividend income. Dividend growth investing isn’t going to make you rich overnight. It takes patience and perseverance. But a 3% return from dividend payments sounds a lot better than most bank accounts offer right now – and 3.3% the next year sounds even better. Re-invest your dividend payments for long enough and compound interest will start working its magic. Have you fallen in love with dividend growth investing yet? Great introduction to Dividend Growth Investing, Maria! I’ve been taking a more conservative path and have been investing in index funds. Just like stocks, they also give dividends, but are usually less volatile as it is built upon a bunch of stocks. Glad you enjoyed the article Smart Provisions. Index investing is great and low risk compared to DGI. What you do lose though is the ability to pick up bargains (if you learn how to spot them). I like to think of my portfolio as my own index fund :)! Hi Lewys – I’m a recent fan of dividend investing too, also focusing on investments with a very lengthy track record of paying increasing dividends. Personally, I opted for investment trusts so the money was spread over multiple companies chosen by a professional fund manager. Does mean the returns have to cover a management charge, but there are trusts with lower fees than others. Good luck with your investments! @Faith: May be worth looking at other options. You know research shows that index funds outperform managed portfolios (by fund managers) every time?